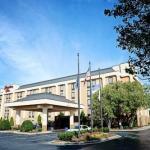 Free internet free hot breakfast and a shopper's ideal location impress our guests who have stayed at the non-smoking Hampton Inn Rock Hill. This 163-room hotel on five floors offers free high-speed internet and all rooms have microwaves and refrigerators cable TV work desks and super-comfy beds with crisp white sheets and fluffy duvets. The hotel provides a free hot breakfast buffet with make-your-own waffles and plenty of hot and cold options. A manager's reception held every Wednesday features free snacks and beverages. The business center has your back with copy and fax services and the outdoor pool hot tub and fitness center are just what the doctor ordered to keep you in shape and relaxed during your stay. There's a laundry facility on-site which comes in mighty handy when you're on the road. Pets are allowed with some restrictions and parking is free. If a little retail therapy is in order the Hampton Inn is less than a half-mile from Rock Hill Galleria. Cherry Park and Glencairn Garden are within 10 minutes of the hotel. Carowinds theme park is 20 minutes away and Historic Brattonsville a 775-acre living history Revolutionary War site is 25 minutes. Charlotte Douglas International Airport is 25 miles from the hotel.